Since 2001, the Pediatric Brain Tumor Foundation has empowered childhood brain tumor survivors to reach their educational goals by awarding more than $1.7 million in college scholarships. As part of our mission to help all families and survivors thrive, the PBTF is expanding its 2018 scholarship program. Vocational, trade and technical institutions will now be included for survivors with other career aspirations. "We see great strength and courage in all survivors and are honored to help them achieve their dreams," says Kathy Riley, MPH, CHES, national director of family support at the PBTF. 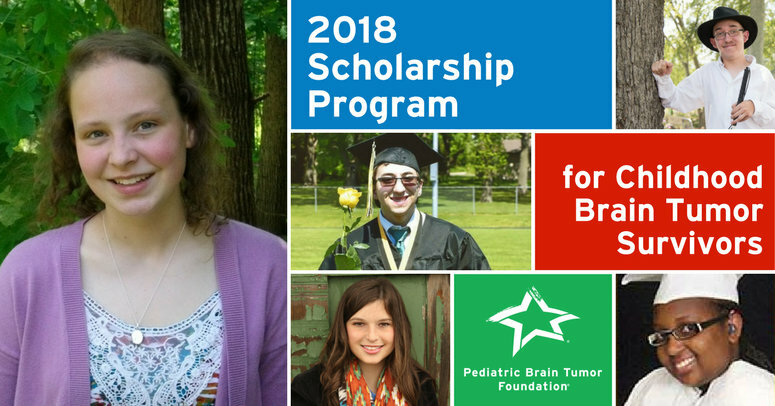 "The Pediatric Brain Tumor Foundation Scholarship Program gives us the privilege of supporting our brain tumor survivors in their career aspirations whether they attend a college or university, or a vocational, trade, or technical school." The 2018 scholarship program will award one-time scholarships of $1,000 to high school seniors, high school graduates or college students pursing an associate or bachelor’s degree or certificate from an accredited college or university or vocational, trade or technical institution. Awardees of the 2018 PBTF scholarship also will be required to participate in the PBTF Scholar Service program. This program gives recipients the opportunity to serve others who have faced similar challenges by partnering with the PBTF in their community. The 2018 scholarship application will be available Jan. 12, 2018 at curethekids.org/family-resources/scholarships. 2018 Scholarship winners will be announced in July 2018. If you wish to be a part of this legacy by providing the gift of education to childhood brain tumor survivors, please visit curethekids.org/family-resources/scholarships/fund-a-scholarship.html.